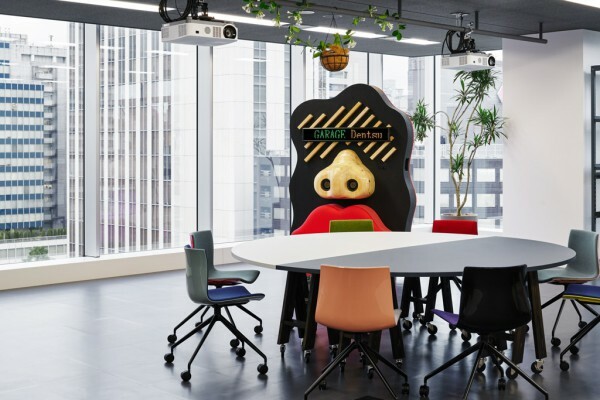 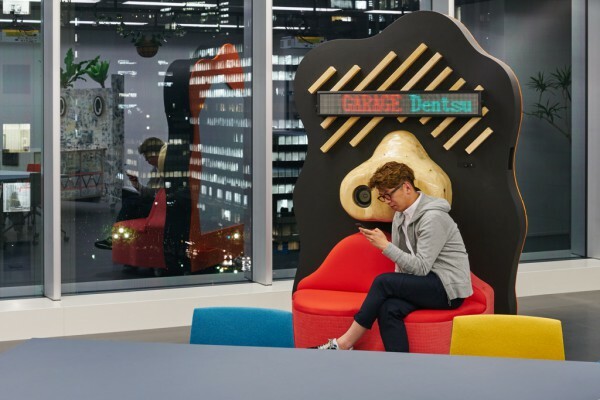 We performed the renovations for Dentsu isobar's latest multi-purpose space located in a corner of the company's 8F office in Higashi Ginza. 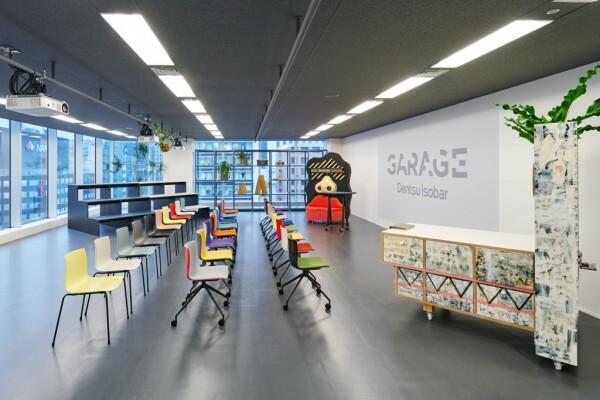 The room is intended as a flexible garage-type area that can be used for a variety of purposes, such as a showroom, for workshops as well as presentations. 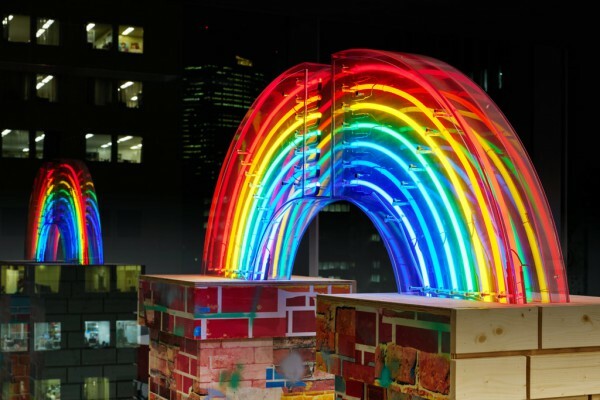 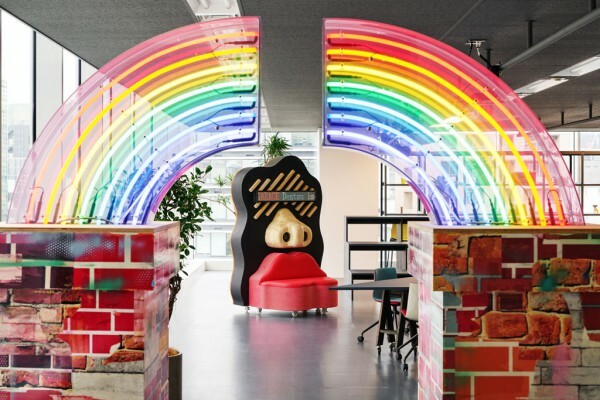 When entering the room from the common corridor through a black tunnel, employees are greeted by "Chimney-Rainbow" - neon arches created by a two-artist unit known as magma. 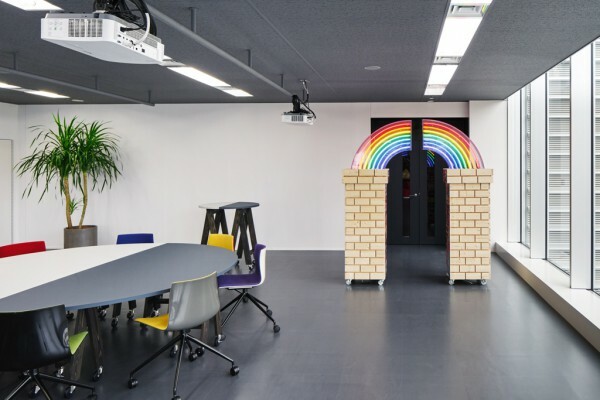 The projected images from 4 hanging projectors are juxtaposed seamlessly onto a long white wall. 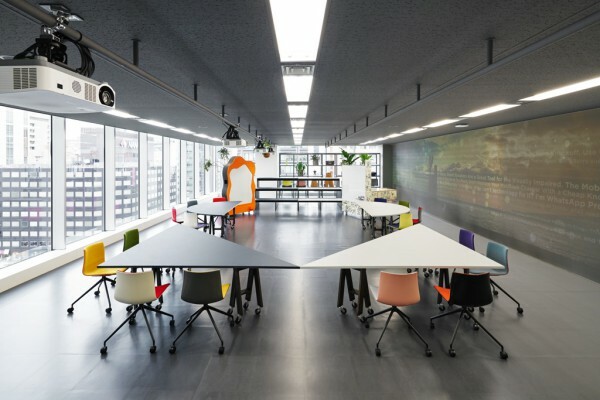 Moreover, the layout of the whole space can be rearranged according to use and number of participants thanks to movable tables consisting of triangle- and semi circle- shaped tabletops mounted on dyed custom order AA STOOLs fitted with wheel casters as well as movable stair-shaped rows of seats. 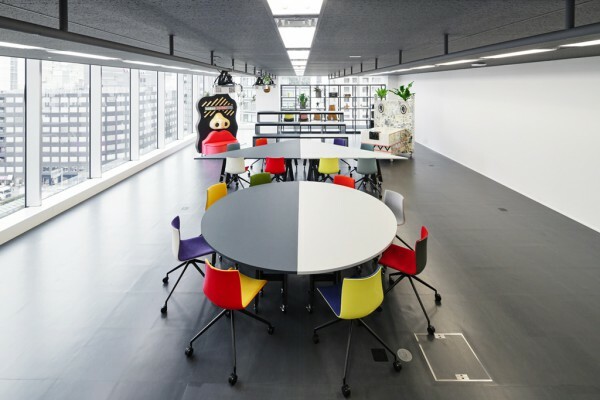 Unlike square tables which can be aligned neatly, geometric shapes present a challenge that boosts the creativity of those using the furniture. 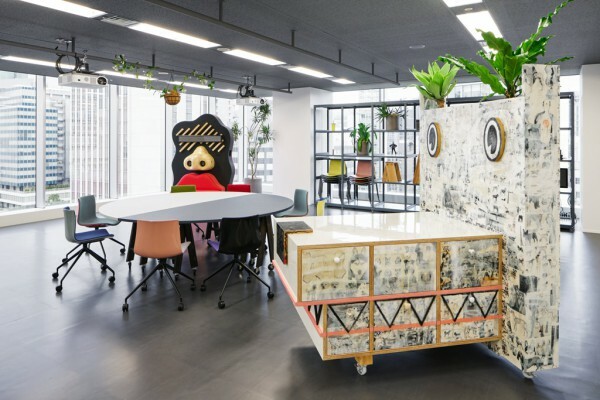 Designed by magma as dual-function pieces of furniture, the back sides of "Face Sound System" - a bench with built-in speakers - and "Dog Shelf" - a table with built-in drawers can also be used as white boards. 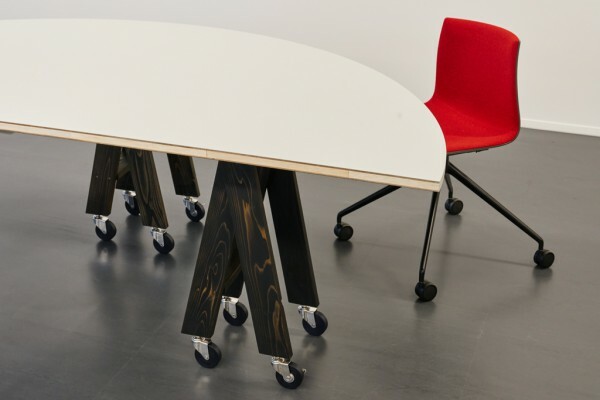 These can also be moved freely to conform to the configuration of seats and tables. 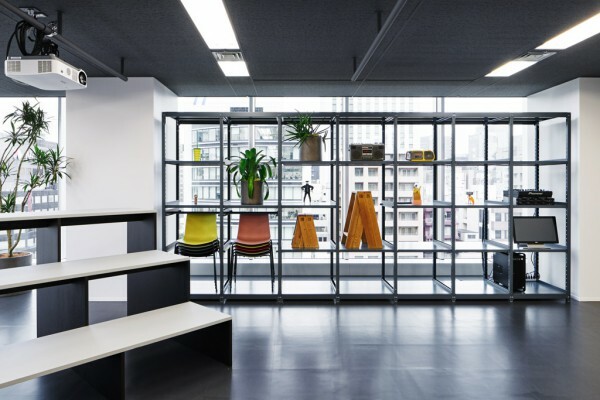 Our aim was to create a space with ample room capable of accommodating a variety of activities while becoming a source of inspiration for clients and employees alike.